"Hollywood makes movies about battles, helicopters, and daring escapes in the Vietnam War. For courage and drama, however, nothing fictional matches the reality of Bennie Adkins' memoir." Heroes of wars lost go forgotten, as with the British soldiers of the American Revolution. So, too, brave men in America's Vietnam, a consequence of defeat. On September 15, 2014, retired businessman Bennie Gene Adkins of Opelika, Alabama received the Medal of Honor for his heroism in the 1966 Battle of A Shau. Adkins writes that he wears the medal for "the more than fifty million men and women who have served this country in both times of war and peace." Adkins also wants the public to remember "the 2.7 million Americans who fought in Vietnam, especially the more than fifty-eight thousand who died there, twelve hundred of which never came home." A Tiger Among Us tells how Adkins received this honor from the experiences of seven survivors of A Shau and the official records. 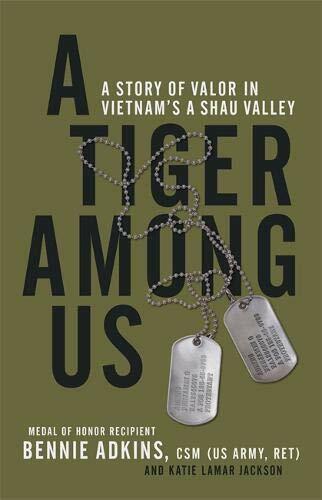 The author found himself pursued through the jungle by not only North Vietnamese regulars but also "a four-hundred-pound Indochinese tiger drawn to us by the smell of blood and crud." The book tells Adkins' life story as he gave it orally. Whatever it lacks in formality, his intimate account more than gains in adventure, humanity, and heartbeat level reality. The book abounds in details about the Special Forces, Vietnamese soldiers, Montaghards, food, helicopters, rain, monkeys, and tigers. A Naive of Waurika, Oklahoma, Adkins "was not unhappy with the situation" when the peacetime draft took him from odd jobs into the Army. As former Secretary of Defense Chuck Hagel writes in the Foreword, "he just saw more opportunity in the military than on the farm." The Army trained him at Fort Bliss, and on his assignment to Germany he met Elvis Presley, becoming a friend of the singer's father. Transfer to Fort Benning brought him airborne training and the challenges of joining the Special forces. "If you weren't competent you didn't last long" but "you were respected as an individual for what you could do, not for your rank." Adkins went on to serve three tours of duty in Vietnam as a member of the Special Forces, called the Green Berets among other names. He also qualified in "sniper, scuba, and high-altitude, low opening (HALO) training." "We [also] train people at every level, from a head of government to the squad and individual soldier level to civilians." In March 1966, the North Vietnamese 325B Division, outnumbering the men of an American-South Vietnamese camp in the A Shau Valley by ten to one, attacked. All that could go wrong for the defenders did although at a cost to the enemy of 800 to 1,200 dead. Of the American survivors, all had taken wounds and only eleven could still fight. Sergeant Bennie Adkins remembered, "we knew the battle was unwinnable, but . . . we didn't give up . . . and not one of us intended to be taken prisoner." The survivors sometimes fought by hand to hand combat to get to the evacuation point. Marine helicopters extracted seventy men but the effort became a mess under heavy enemy fire and as the South Vietnamese troops rioted. “It was time to evade rather than evacuate." With two other Americans, Adkins escaped to the jungle. A helicopter sent for them was shot up, resulting in two Marines added to their escape. Fortunately, Adkins had his military occupational specialty in operations and intelligence, what included training in escape, evasion, and resistance. Hollywood makes movies about battles, helicopters, and daring escapes in the Vietnam War. For courage and drama, however, nothing fictional matches the reality of Bennie Adkins' memoir.